An unknown photographer captured this scene of men, women, and children picking cotton under the watchful eye of an overseer. 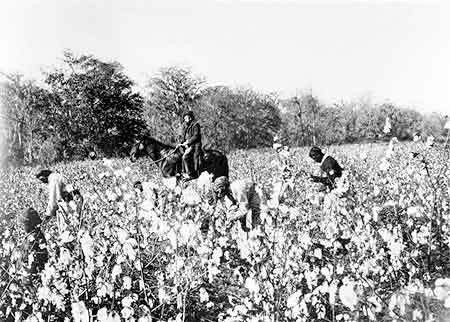 Slaves on cotton plantations worked under harsh conditions. The working day began at dawn and often lasted well into the night. Work was done in gangs, where discipline and the unrelenting pace of work was enforced by a driver or overseer. Whipping was regularly used to enforce picking quotas or increase the pace of work. In what little time they had besides what they spent working for the master, slaves had to do all the chores of daily life: they prepared their own meals, washed and fed their children, cleaned their cabins, washed and mended their clothes, and, if they were especially fortunate, tended their own vegetable gardens.